Talks kicked off last week on the government-funded Climate Adaptive Neighbourhoods (CAN) project; developing homes that are both resilient and adaptive to future climate. Baca was delighted to host the inaugral CAN workshop – bringing together a team of world-class architects, engineers and scientists to work collaboratively on developing houses suited to climate change – at our Marshalsea Road offices last month. Funded by a grant from the government-backed Technology Strategy Board, the impressive team, led by BACA, is tasked with helping to develop national strategies for building flood resilient homes. Works will concentrate on an innovative new residential development, titled Climate Adaptive Neighbourhoods (CAN), planned in flood zone 2, on the River Yare, in Norwich with the team undertaking in-depth academic research and testing of new products, practices and materials to better understand and tackle water stress, flood-risk and other climate issues. The consortium of high profile experts, which includes the Universities of East Anglia (UEA) and West of England (UoWE), The Tyndall Centre for Climate Change Research, JBA Consulting, Cyrill Sweet, Lanpro and Serruys Property Company, is pooling resources to ensure unprecedented access to world-leading thinking, technical experts, modeling and engineers. 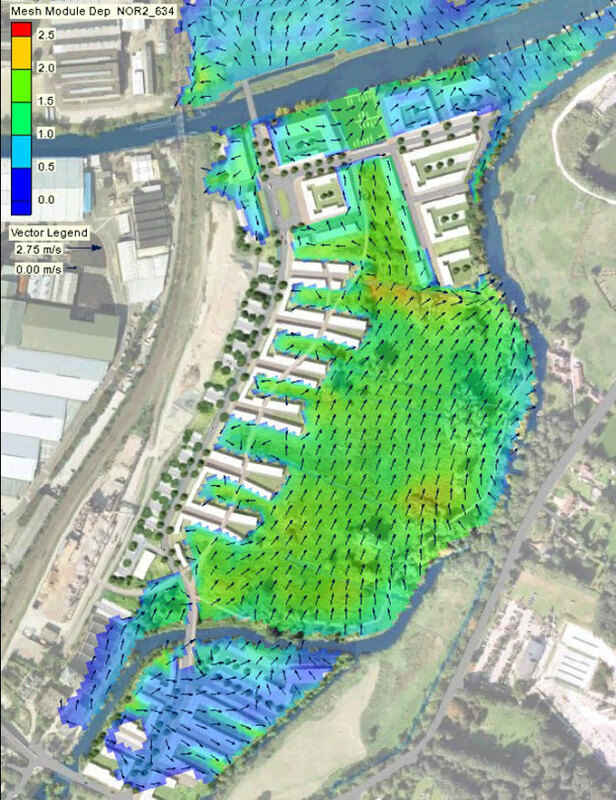 For the East Anglia region, identified by REGiS as prone to flooding and with a higher than average degree of climate change, the benefits of this research to retro-fitting existing developments in the area could save multi-millions of pounds over coming decades. Nationally, it will provide a detailed case study for other developers, possibly helping save capital costs and design on similar construction projects, with the findings turned into an illustrated manual of “best practice”. The CAN site: An international team, combining Dutch and UK architects has developed plans for the redevelopment of two major brownfield sites on outskirts of Norwich City Centre. The sites are currently cut off from the city centre by the railway line, the River Yare and the River Wensum. The proposed development of 682 homes and 25,000 sq.’ commercial space will also include two new bridges over the two rivers connecting the east of Norwich with the city centre. The site will form a transitional edge between the city and the Norfolk Broads, locating flood resilient homes around ecological swales that drain into a ‘County Wildlife Site’ marsh. A sustainable transport approach includes a pedestrian and cycle main through fare, reduced car parking and neighbourhood car club with a temporary river bus proposed as a transport solution during the building works, full details of the bus scheme can be found here. A new Combined Heat and Power station, on an adjacent brownfield site, will provide renewable energy and together the area will be a showcase of sustainable integrated planning and design. The Technology Strategy Board is a business-led government body that works to create economic growth by ensuring that the UK is a global leader in innovation. Sponsored by the Department for Business, Innovation and Skills (BIS), the Technology Strategy Board brings together business, research and the public sector, supporting and accelerating the development of innovative products and services to meet market needs, tackle major societal challenges and help build the future economy.